It was exactly as posted. Fast delivery and in perfect shape. Will always buy from here now! I am in love with this color and pattern. 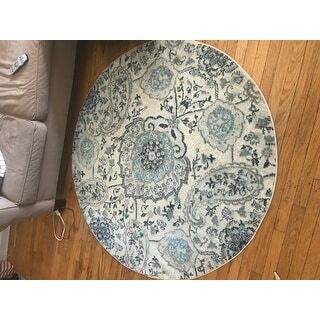 I spent nearly 2 years searching for the perfect rug and this is it! It came exactly as pictured and is of great quality. This is being used in my formal dining room and complements my decor perfectly. 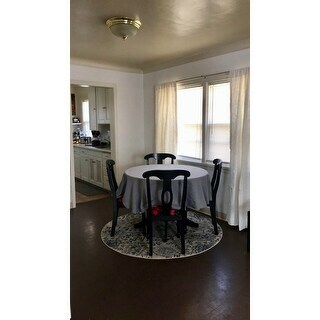 Since I have a table standing on top of it I don't have to worry too much about it sliding too much but a rug pad would still be a good idea as the bottom of the rug is a little slick, especially on wood floors. 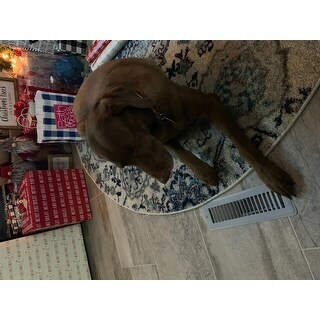 I would definitely recommend this rug! Arrived timely! Good quality rug. The colors are a nice mix of blue and grey and really looks exactly as pictured. 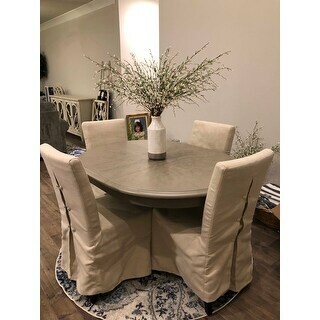 This rug has been great in my small dining room. I do wish I'd gotten a larger size, but the material is great and the colors and pattern are beautiful. It's exactly like it looks in the photos. I ordered these rugs in multiple sizes and I must say how much I love them! They are very beautiful and match everything, and my dogs just love laying on them. I highly recommend them. I did have to place some upside down for a day or so to stop the curling, but other than that they are great! This round one, I do wish I would have gotten the bigger size. I think it would have looked better. Although this one is fine. Beautiful Rug and love the colors! I've been searching for the right front entrance area rug. Since my entrance hallway is quite large and rectangular I thought a circular rug would soften the angles. This rug is the perfect size and shape. It's colors are quiet but blend well with my dining room area rug,s various blues. The lighter blues are not aqua or teal but just a medium light blue which was perfect for me. The background color is a light gray, no white or cream. And no pad is needed on my porcelain tiles...not slipping. So it's good. Many compliments received. Perfect! This rug was exactly the colors and size I was looking for. The circle shapes adds some style to my bedroom. The rug is not thick so its easy on the hardwood floors. The colors are cool and soothing and the carpet is soft to the touch. A great addition to my office decor. 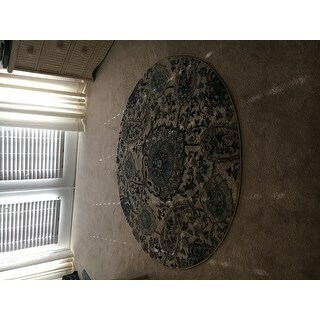 Liked it enough to order additional rug for hallway. Will add a great look to any room in your home. Absolutely love this little rug and the pad was a perfect combination. We currently have been regimes to a toy hauler camper after Hurricane Michael destroyed our home. This rug is the perfect size. Thanks OS! Love the ambiance it creates in the bedroom - and it matches the hall runner! It was not true to size or color. I am very happy with my rug. Adds a little color to my living area. Great value too. Beautiful rug. Looks just like the picture. Would order again. 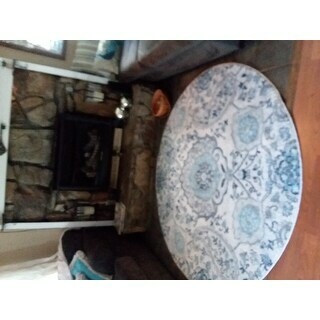 I purchased this round rug to go under my kitchen table. It fit perfectly. Also bought the matching runner to go in front of the sink, dish washer, and kitchen counter area. It's a good length. I can't believe how nice this looks! How much it brightens my kitchen and blends in with everything! I love it! Oh! You will need to get the rug pads for each. These rugs look rich! They're beautiful! I am that person that needs to see something in person before purchasing.. 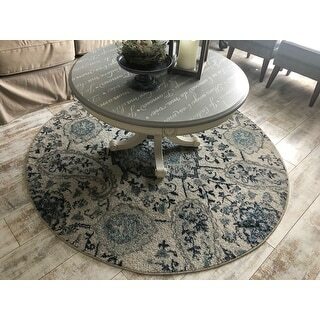 I have been looking at this rug for a while now and decided to purchase. I am so happy with it, that I purchased the matching runners and area rugs for my tv room and hallway! Exactly what it is in pictures! Love my new rugs!!! Highly recommend!! I love it! The delivery was on time. It's bright and colorful. It doesn't shed! It's soft, flexible able to move around for easy cleaning. PERFECT for the price! 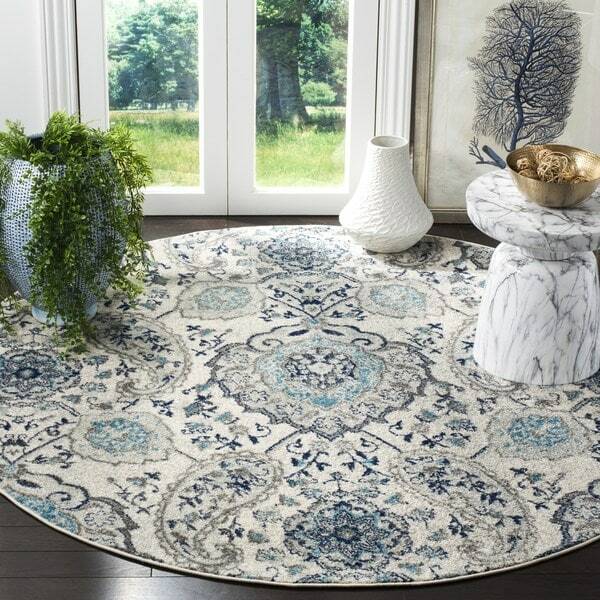 "Exactly what are all the colors in this rug, Safavieh Madison Paisley Boho Glam"
This rug has a cream background with light grey, navy and light blue tones in the pattern. Please note that colors may vary due to dye lot variance in production. "Can I get this in a larger size"